I use an 8 1/2" x 24 1/2" Creative Grids ruler. Make the 8" mark first, then work back down the numbers. I've never tried a curved cross hatch. So have you seen a tute on this or a sample somewhere? I use blue painters tape (as was recommended here) and my regular 8"x24" inch ruler. I have a 5 foot T that I picked up at a garage sale - between that and using a yard stick, I can usually get my line marked. I use it to mark my first line and then I use my quilting bar set to whatever distance I want the lines to be apart and then stitch away. When I finish going one way, I mark my line going the other way and then I'm off stitching again. http://blog.petitdesignco.com/2012/1...-quilting.html scroll down and click on curved cross hatch stitching to see diagrams on ways to do that. lots of info on different stitching in this blog. great!!! Are you refering to grid work on a LAM or DHM, and just need a ruler for marking a quilt? With more info we can give you a better response. 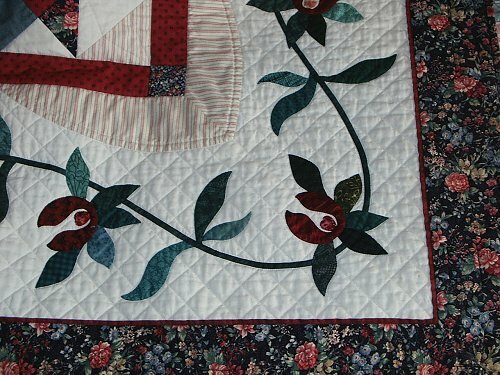 I had the exact same question - are you hand quilting or longarming? All you need for cross hatching is a straight ruler - and a curved ruler with 1/4" line for curved cross hatching. It's super simple but extremely effective! I do both on my long arm AND my regular domestic home sewing machine. I mark lines on the quilt for both with the rulers...with the long arm I need to use the ruler for curves but on the sewing machine I just free hand it over the pre-drawn lines. I mark first row then use my walking foot to keep distance..I have had a thought while reading other replies for marking. A first line with a normal ruler and additional lines with the square ruler with slits in. ( forgot or never knew name). Do other people cross hatch before the applique or do the block. I hate the stop start when applique is present. I...Do other people cross hatch before the applique or do the block. I hate the stop start when applique is present. I do too, Dotty. On this QAYG king size quilt, I stitched the cross hatch and then did the applique. Worked out fine. This is what I do too! Works great! Don't use rulers. Get that blue painters tape and line up the tape and stitch right along side it. And don't put the tape all over the piece - you can move it several times before it picks up too much fuzz to stay stuck. You can get it in different widths, depending on how wide you want your cross hatching. I've also used masking tape, and it's a little less expensive. I only put it on when about to stitch a line, and afterwards take it off right away.